Acquisition refers to the accurate placement of the target(s) in the field of view of a camera or the slit(s) or Integral Field Unit (IFU) of a spectrograph. The Gemini spectrographs often are designed with the option of very narrow slits to take advantage of the high quality images delivered by the telescope. The positioning of targets in such narrow slits requires care. The basic procedures outlined below will provide the best slit centering possible given current telescope offsetting performance. The best slit centering is achieved when the target can be detected in modest (<1 min) acquisition images. The centering is fine-tuned by the observer and will be better than 10% of the slit width. When centering on the actual target is not possible, a reference star at an accurately known reference position is used instead. The telescope is slewed to the science target first, and guiding is started. The telescope is then 'offset' to the reference object, which is used for fine-tuning the slit centering. The offsets are then removed to return the telescope to the position of the science target. The accuracy of such offsets decreases with increasing distance to the reference star, so it is important to choose the nearest reference star possible. The current offset accuracy is approximately 0.2 arcsec for a reference star 50 arcsec from the science target. The Phase II Science Program must contain clear instructions on what the offsets are to the reference object. The preferred way of specifying offsets to the reference object is to include accurate coordinates for the reference object stored as a "Blind Offset" target (i.e. Type Tag=Blind-offset in the Target Environment). The base position is the science target. It is essential that the coordinates of the reference star be accurate and be in the same reference frame as the coordinates of the science target so that the telescope control system will determine accurate offsets between the two positions. Both coordinates must be specified in J2000. It is important that the relative offsets between the reference star and the faint target be very accurate. These offsets are best determined by measuring the positions of both objects on the same image with good relative astrometry. If the science target, reference star, or the guide star have proper motions, then these should be entered in the Motion section of each target. 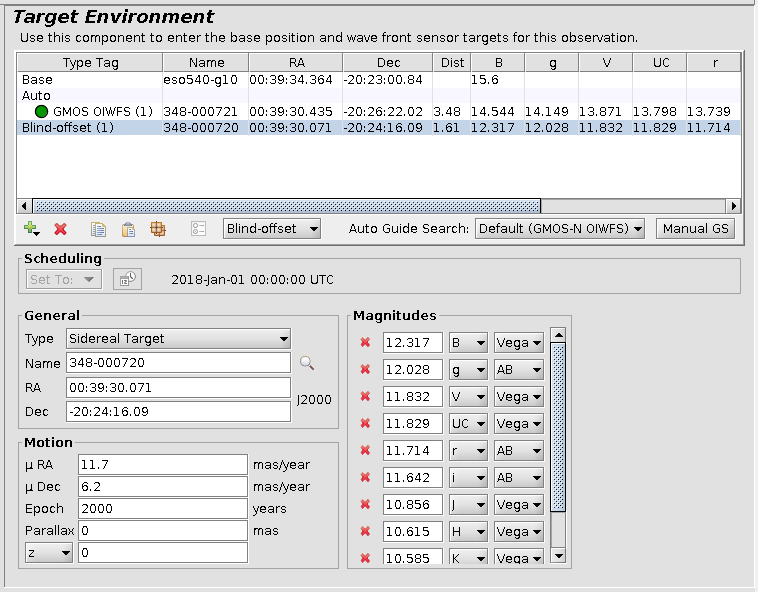 No matter what method is used to specify reference object offsets, the wavefront sensor used for guiding must remain active during the offsets to the reference star. It is important to check that the guide star is accessible for both the science target and the reference star. Offsetting to a reference object may also be helpful for brighter targets when the science target identification might be confused, as in crowded or complex fields. Additional information about complicated setups should be included in a Note in the OT. Mid-infrared observations also require an additional "hot-spot" star, as detailed on the mid-IR astrometry web page. See the GMOS target acquisition information.